HOLIDAY GIFT SET: 2 Blender Sponges & Kabuki Brush Gift Set! This gift set is my own design for makeup lovers! The perfect gift for the girly girl. COMPLETE BEAUTY MAKEUP GIFT SET: The premium quality BEAUTILEE MAKEUP BLENDING SET gives you the professional airbrushed look. a portion of the proceeds of your BEAUTILEE purchase goes to support Women for Women International; We participate in Amazon’s Free Returns program so buy with confidence; order the BEAUTILEE MAKEUP BLENDER GIFT SET today and get two sponges, one brush, and instructions. Want a refined, professional look to your makeup? PERFECT BEAUTY AT A FRACTION OF THE COST! Use dry concealer with dry sponge. Wash used sponge with soap & water, air dry. Use brush to soften lines & finishing touches. It’s the PERFECT Blender Sponge & Kabuki Brush Gift Set! which Oprah Winfrey also promotes. 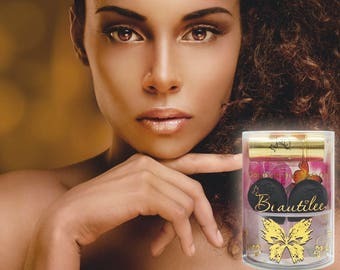 Get your BEAUTILEE MAKEUP BLENDING SET by clicking the ADD TO CART button. Ideal for those who want to look their best!